A. D. Foote was noted for his horticultural skills. It is a well known fact that he designed the North Star House woodland landscaping that surrounds the house. In the winter, the North Star, the Little Dipper constellation and the Sutter Buttes are in view from the veranda / terrace. The Little Dipper is laid out with bronze stars on the terrace floor. It is told that Julia Morgan did the measurements. The vast front lawn that spreads in front of the Julia Morgan designed brick and mine rock terrace is bordered with Washington hawthorn hedging. This hedging hides the North Star Road that leads up from Auburn Road winding around to the back patio of the house. There was a metal gate and two mine rock columns in the hedging that opened onto a brick lined path leading to the terrace. An iron horse-hitching post is still nearby. On the right side of the lawn a Southern Magnolia tree, columnar variety, was planted as an exotic plant focal point. Further to the right very close to the road, Mr. Foote created an edible fruit and nut orchard containing persimmon trees, hazelnut, quince, pomegranate and cherry trees. Most of these trees are still growing and have been identified as Felix Gillet hybrids. Gillet was a famous Nevada City fruit and nut tree hybridizer in 1890s. Many of Foote’s plantings were purchased from his nursery. A Korean style shed was built on the far end of this orchard. A palm tree, another exotic touch, was planted in front of the shed. Bellflower apple trees were planted on the far left of the lawn area. Five AD Foote hybrid holly trees were planted as a windbreak on the nearby road. Many poplar trees were planted along the road but none have survived. The north side of the house contained many of Foote’s plantings. A tulip tree (Liriodendron tulipifea) was planted close to the house in an area that contained plantings of deutzias, azaleas, pyracantha, and peonies in amongst the Ponderosa pines. A tall Eastern American tree in the Magnolia family, the tulip tree grows profusely in the Hudson River valley, Mary’s childhood home. It can be viewed from Mary’s study and the dining room windows. A climbing rose of unknown variety bordered the study window. There were many footpaths lined with mine rock and different grasses. We have a photo of a rubber plant, another exotic touch, planted on one of these paths. In the patio area, Julia Morgan designed both the pergola supported by two mine rock columns and the reflecting pool. Foote planted a grass lawn around the pool and added two yew trees planted “side by side”. Two ceramic jars were placed “side by side” to the right of the pool near the corner of the house. The first rose to be planted on the pergola was an 1853 French climber, Gloire de Dijon, creamy buff colored, double blossom rose. Mary reports that Betty used these roses in her 1907 wedding. This rose suffers from die back and mildew and by the 1920s was replaced with Banksia lutea. These yellow flowered rose bushes grew profusely to cover the pergola and the surrounded upper story balconies. The rose garden enclosed by a boxwood hedge that ended at the corners of the house was created over a period of time. It was quite developed by the time that Foote retired in 1913 and his grand children reported that he often sat on a high stool pruning his roses. A big flower bed and more roses extended beyond the hedge. Only a few roses were found in 2003; Baronne Provost, American Beauty and Dainty Bess and two root stock roses, Manetti and Dr. Huey. This formal rose garden ended at the edge of the house where an exuberant flower garden flourished in woodland style. There was a path that lead down to the vegetable garden. Another path lead to the raspberry-blackberry area that is now the site of the North Star Heritage Garden. The family reports that Luther Burbank white blackberries were a family favorite. Burbank’s thornless blackberries are still found in the area. A row of AD Foote’s hybrid hollies separated the two gardens. One holly remains today along with some hollies that the school planted. Opposite the rose garden and the circular drive there was an area of large plants extending to the main road. Shrubs included crape myrtle, snowball viburnum, camellias, dogwoods and flowering ornamental trees. A row of AD Foote hybridized hollies created a border along the main road. Mine rock pillars and metal gates were installed at either end of the circular drive. A small car garage built on the right was eventually replaced by a large garage further to the right. All that remains of the later are the three mine rock walls. The path from the patio to the orchard meandered through natural woodland of ponderosa pines, black oak, live oak trees and manzanita shrubs. Ferns were planted under the windows on this side of the house. The entire area round the North Star House and garden areas was fenced with farm fencing and wooden posts. The Hague House can be seen up on the hill from the patio area. This 1911 house, designed by Robert Swain Peabody of Boston was built for Billie Hague, son of James Hague and nephew of AD Foote. 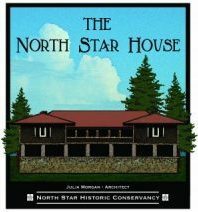 Billy became the North Star Mine manager in 1908 after his father died. The Hague House landscaping was Victorian in nature with old fashioned mock orange and Bridal Wreath spirea shrubs that have been included in the Heritage Garden. Three Douglas firs and several chestnut trees were planted in the vast front yard. A row of willow leaf cotoneaster was planted as a hedge to block the view of the North Star House. A rambling Cherokee rose and trumpet vines are on the kitchen side. Rhododendrons, Lee’s purple and a blue “ augustinii, are on the Master bedroom side. All that is left of the rose garden is part of the boxwood hedge. A honey locust tree was planted outside of the dining room double doors. Several weeping type birch trees, are near the swimming pool, All are still surviving except the roses. In 2003, when we first acquired the property, Carole Miller began documenting the roses, shrubs and trees on the 14 acres. The information gathered came from Foote family members, E. Gardiner’s Foote’s garden map and from consultations with horticultural experts in the field: Lee Dempsey, rose expert, Amigo Bob Cassano, Felix Gillet expert, Carolyn Singer, Nevada County horticulturalist, Mr. Figuerro, Empire Mine Ranger, Curators of Luther Burbank Experimental Farm in Sebastopol, CA. This information was used on the Master Plan.